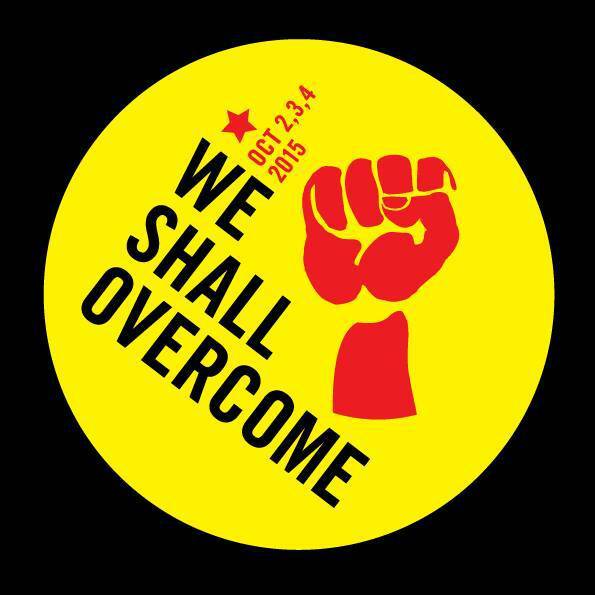 Thee Faction’s next gigs are part of the nationwide We Shall Overcome weekend. Baby Face explains what it’s all about. This year we’ve done some big gigs: Glastonbury, Tolpuddle, the Corbyn fundraiser. But our next is the biggest. 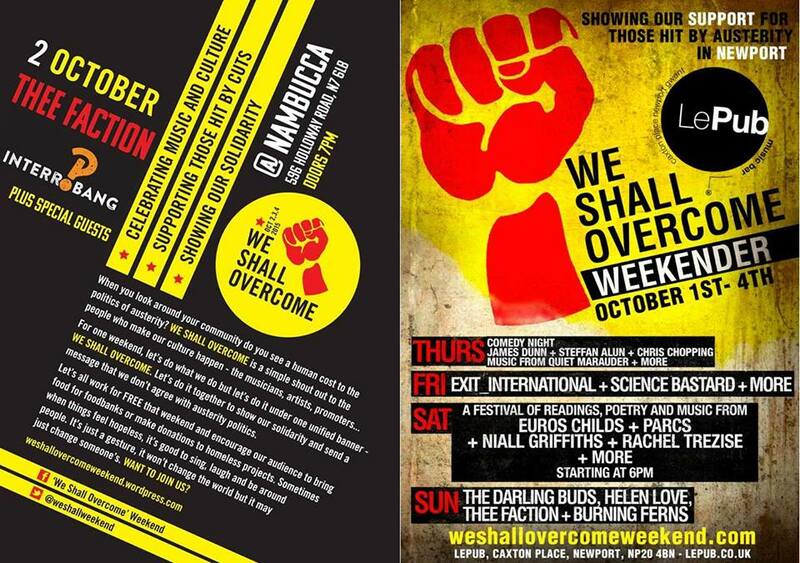 Because on the first weekend in October we are taking part in the We Shall Overcome weekend. The weekend acknowledges two things. First, it acknowledges the horrendous dismantling of society that the Tories have been pursuing. We have never been so socially insecure since before 1945. There is no safety net we can reliably fall back on. Everything is precarious. So everyone is a failed pay cheque or two away from absolute destitution. And that means that an enormous number of us are already there. Secondly, it acknowledges that every night socially and politically conscious musicians are busy, in ones, twos, threes, fours, playing in pubs and clubs across the land, doing their bit and making a little bit of noise to a relatively small number of people. So let’s throw these two things together. Let’s get all of those musicians to play, across the same weekend, to make a noise about austerity. To stand up to and, yes, overcome austerity. Let’s play for free, where possible, and let’s take donations for carefully chosen charities that will do their bit to alleviate the social destruction of austerity. Of course, the election of Jeremy Corbyn as Labour leader has been a huge boon to the spirit of anti-austerity. But this is not a party political weekend. It’s fair to say that the vast majority of the UK’s left-wing musicians are involved in this, and we suspect the involvement of the right will be non-existent. But it is being organised under a single banner: We Shall Overcome. Comrade Joe Solo has done phenomenal work to piece this whole thing together. There are well over 200 events happening, under one fist. We would honestly recommend that you turn up to the one nearest you. It’s not really about travelling miles to see your favourites. Go local. Meet like-minded people. Discuss how to keep the momentum up. Organise the next one. Share ideas. Make more stuff happen. But if you do want to see us, we’re playing twice. On Friday the 2nd October we will be playing at Nambucca in Holloway – deep in the heart of Corbyn country. It’s an amazing line-up: Keith Top Of The Pops & His Minor UK Indie Celebrity All-Star Backing Band will be kicking the evening off. Interrobang!? (pretty much our favourite band of the moment) are on next. And then us. You’ll recognise lots of people in the other bands. Keith TOTP’s band includes all sorts of minor celebrities, from bands like Carter USM, Gay Dad, and even Thee Faction. Interrobang!? feature two members of Chumbawamba (Harry and Dunstan) and one of Regular Fries. We’ve not done enough of this kind of thing this year. It’ll be really lovely to play with a load of good friends, in a pub in London, with a lot of friends in the audience. We’ve not done it since the pre-election gig at the 100 Club. So come. We’ll be asking for a suggested minimum donation of a fiver. On the Saturday members of Thee Faction are doing other We Shall Overcome gigs in London with their other bands. We’ll tell you more about that nearer the time. On the Sunday we’re off to our second home: Newport, South Wales, to play at our favourite venue Le Pub. Sam, the woman in charge of the place, has been tireless in her commitment to WSO, and Le Pub is hosting an entire weekend of stuff. We’re slotting into the final bit, warming the crowd up for local heroes, and very old friends of Thee Faction, The Darling Buds. Also on are the Burning Ferns and Helen Love. Again, an amazing night. If you’re local to Newport, get down there for as much of the weekend as you can. In its own way the We Shall Overcome weekend will be one of the most important cultural events of 2015. Austerity can only be countered en masse, with huge gestures of solidarity. We have to be seen to have numbers. So do your bit. Get to as many events as you can. And, if you’re near ours, get to ours. We’d love to see you.